Students often find it helpful to cycle through a book twice for review. With our study blocks feature, Cram Fighter makes it easy to give a resource a second pass. Study blocks are mini-schedules within your overall schedule. In each block, you can select different resources, set different hours, or change other settings. To go over a resource more than once, simply select that resource again when creating a subsequent study block. Some students like to skim a given book on their first or second pass. Keep in mind that the length of your study block will determine how quickly you move through a given resource. So if you'd like to skim a book in a short period of time, make sure to change your study block dates accordingly. 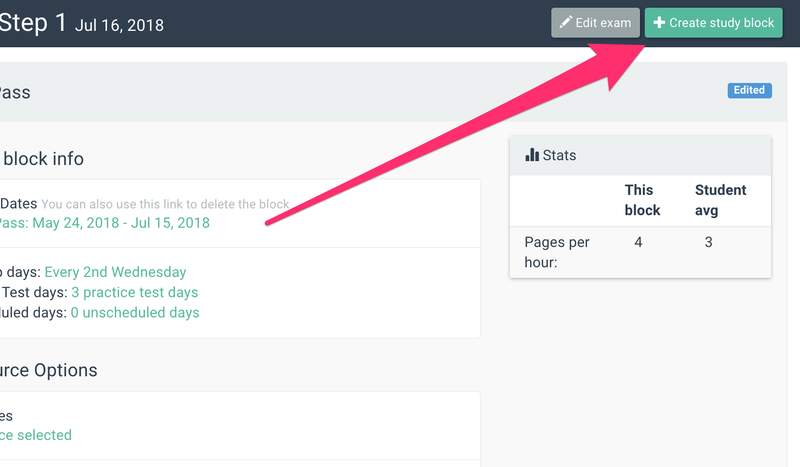 To add a study block, go to the Edit page. Next, find the exam for which you would like to create a study block. Then, click Create study block in the top row your exam's overview. You can also rename or change the dates of your existing study blocks by clicking on the dates listed under Study block info.